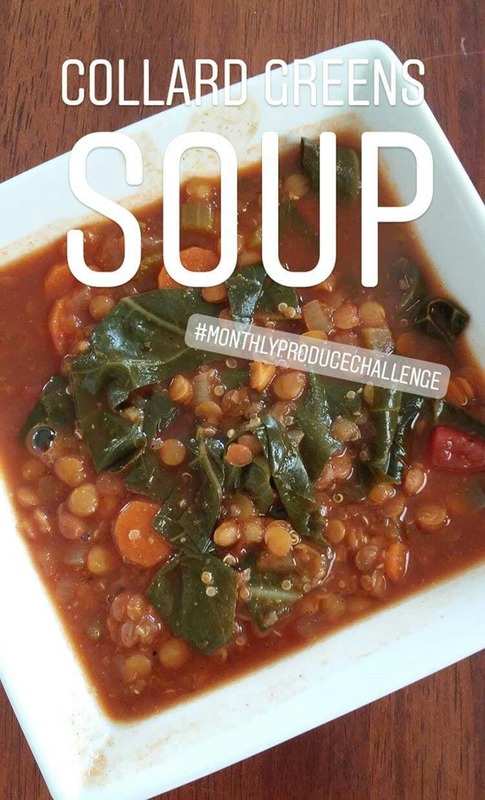 Welcome back to the third update of the Monthly Produce Challenge! If you’re just joining us, you may want to head on over to THIS post first to get all the details of the challenge. 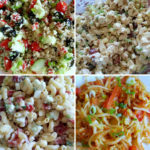 Then come back and find out what the vegetable of the month is and get started adding variety to your family’s diet. 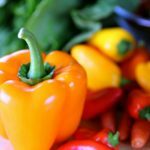 Other reasons to do this challenge are to save money by eating in season and to discover new ways to enjoy foods that we might normally shy away from. In March, my family incorporated collard greens into a couple of our meals. 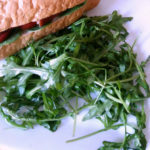 We tried these greens as a wrap, in soup, and added to rice. My family eats a lot of spinach and spring lettuce, so I figured that adding collard greens wouldn’t be too difficult. Also, I had never bought them nor tried them in my life. Because I had never tried collard greens before, I wasn’t so sure how to add them to our diets. I also had no idea if I or anyone in my family would enjoy them as I prepared them. We ate collard greens in four different meals in March. I shied away from any recipe where I had to saute them, but if you like sauteed greens definitely look for those recipes. 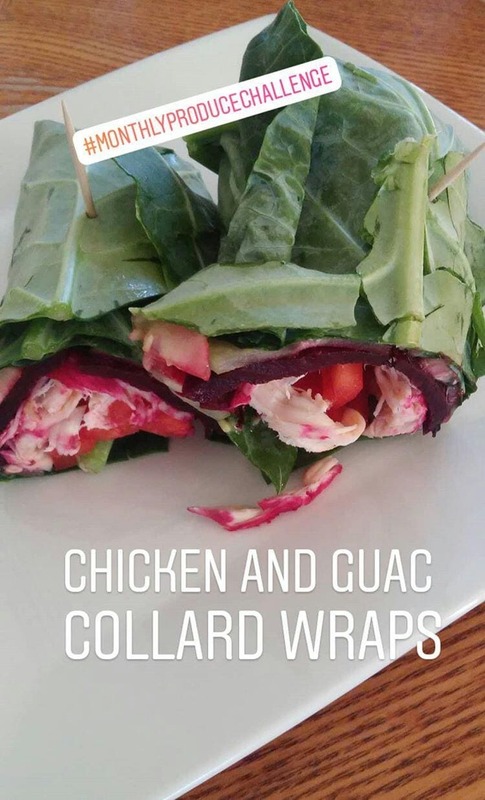 I changed the recipe for these Turkey Collard Wraps a bit, which is why I renamed them Chicken and Guac Collard Wraps. Instead of mustard, I used guacamole. Instead of turkey, I used shredded leftover rotisserie chicken. I couldn’t find sprouts so we didn’t use them. 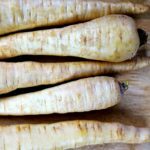 I loved the roasted beets in these, so I’d definitely not skip that part if you wanted to try it yourself. I was surprised that none of my kids complained about this meal. My girls were actually eating the collard greens more than the other food that was in their wrap. Weird? My husband didn’t try them because he got home late and ate leftovers. I liked them, but I prefer eating a wrap that is in a tortilla. This Collard Greens Soup has a long list of ingredients, but everything is all normal (no exotic ingredients), and there are no processed ingredients. It’s as simple as any soup to make. I like that it has both quinoa and lentils to make it a one pot meal. This recipe makes a lot of soup, so if you don’t eat it all right away you’ll have plenty for leftovers or for freezing. My hopes were really high for this soup in terms of taste and getting my kids to eat it. Unfortunately, it fell a little flat in taste, even though there are several spices in it. If I were to make this again I would use stock instead of water to make it more flavorful. I was worried that my husband would complain about it being too healthy, but he ate it like a good boy. 😉 My kids, however, wouldn’t really touch it. I assume it was because of the collard greens. I bet I could’ve added a little sour cream or cheese and maybe even some croutons to make it more appealing to my kids. Black-Eyed Pea Soup with Collard Greens and Sausage was easy to make and tasty, too. I am always a fan of sausage (as long as it’s not spicy), and the sausage definitely made this soup really good. I couldn’t find a can of black-eyed peas, so I had to buy a bag of dried and cook them myself. Apparently, this meal is great to make on New Year’s Day, so I’ll have to remember that for next year. 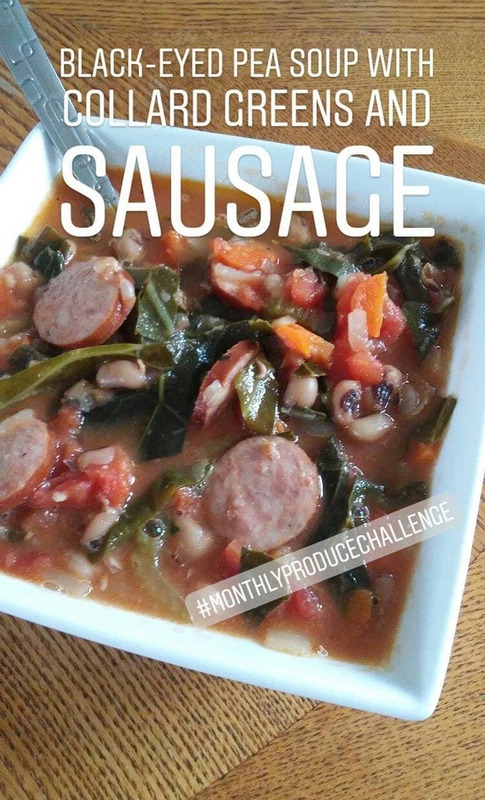 My kids were picky about this soup because of the collard greens, so they really only ate the sausage. When I fed it to them as leftovers, I just left the greens out so they would eat more. I figured the greens left some nutrients in the soup and they’d at least get some nutrients that way. I also left them out of my toddler’s because I didn’t want him to choke on the greens. If I were to make this soup again for my family, I’d chop the greens into very small pieces. We ate the rice with chicken legs and a smoothie. My toddler and middle daughter actually ate the rice, but my oldest didn’t want to eat it all. My husband wasn’t a fan, and he normally loves chicken and rice. I’d say it was tasty but just too heavy for me. How Much Do Collard Greens Cost? 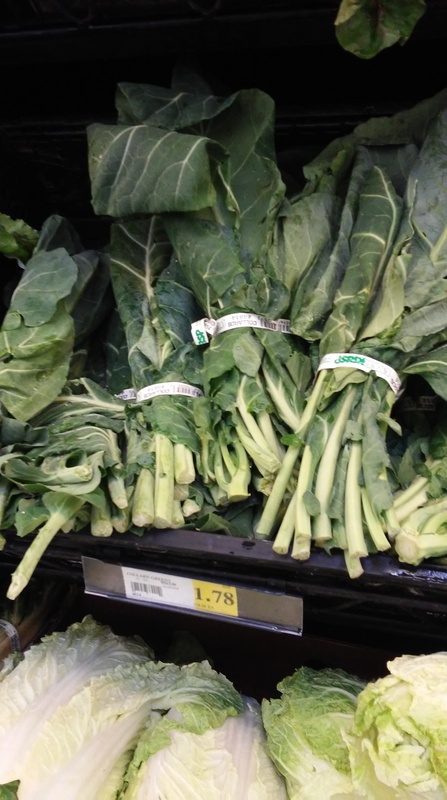 Collard greens are priced by the bunch and they ranged in price from $1.28-$1.78 a bunch where I live (in March). I bought 3 bunches of collard greens for a total of $4.34 or $1.09 per meal. 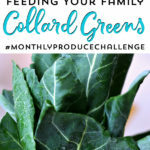 The best time to use collard greens is the first part of the year, January through April, since that is their peak season. 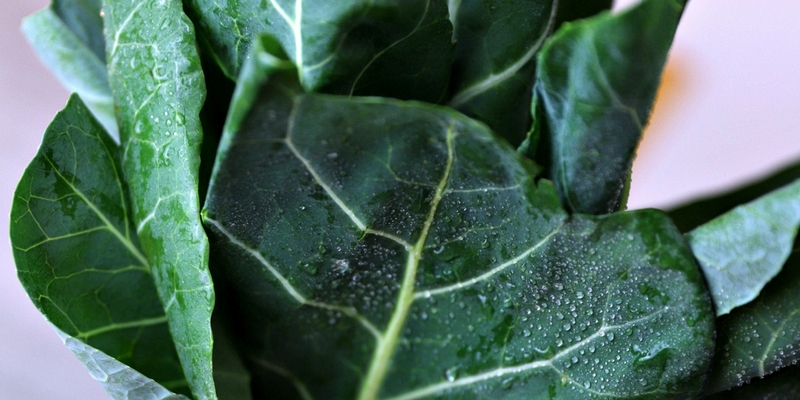 When choosing a bunch of collard greens, look for leaves that are dark green without any yellowing. You can take your collard greens home, wash them well and let them dry, and then store in a zip-top bag with a paper towel in the crisper. If you know how you’ll be using them, you may want to remove the tough stems before you store them. Eat your greens within 5-7 days. 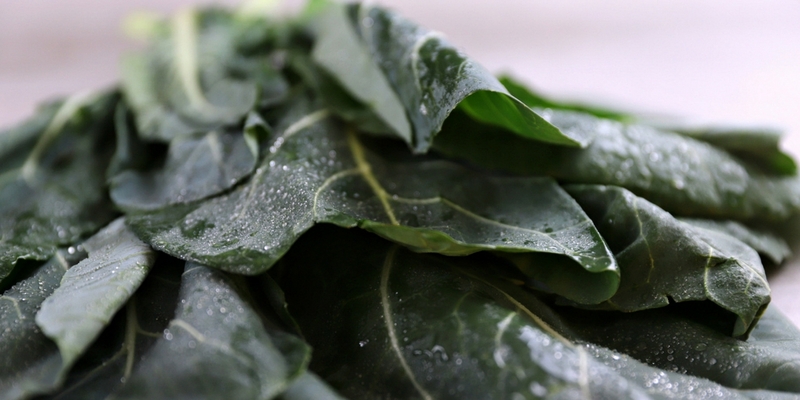 Depending on how you’ll be eating your collard greens, you probably want to remove the tough stems. To do that, lay a leaf flat in front of you on a cutting board and take a knife and cut along the outer edge of the stem to remove. 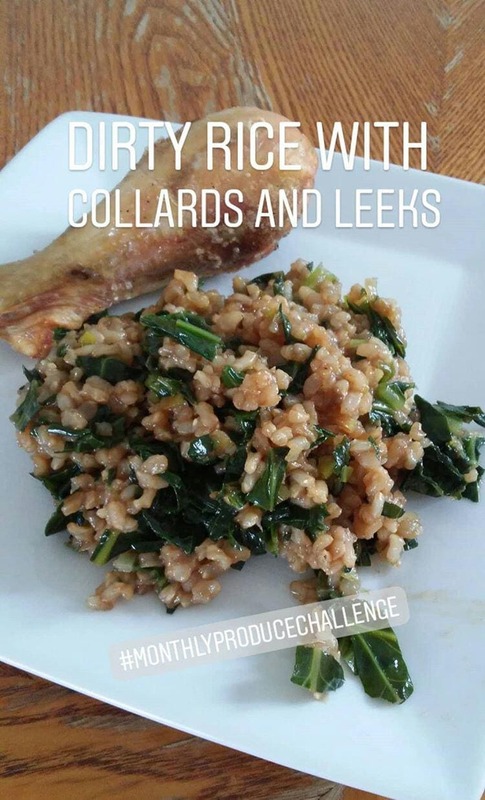 There are several ways you can use collard greens, including sauteed, raw in salad or as a wrap, in soup, or as an addition to omelettes, rice, or stir-fry. Truly, you can prepare them however you’d like! Collard greens are a great food to eat for antioxidants and to fight inflammation, which both decrease your risk for cancer. They’re also great for your heart and contain lots of fiber. For more nutrition benefits, head on over to this article on Dr. Axe. 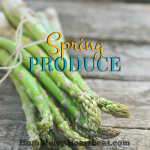 We’re already heading into a new month, which means another new vegetable! In April, my family is going to be eating a lot of asparagus. We already like asparagus and eat it a lot while it’s in season, but the only way we’ve tried it is roasted. So we’re going to try it many other ways this month. 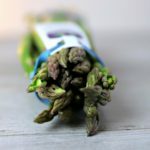 Be sure to follow along on Instagram so you can see how we’re using asparagus this month.